PremiumSoft released a new edition to its Navicat line of database administration tools. Navicat Premium lets users manage different kinds of database servers within a single application. Supported database servers include MySQL, Oracle, and PostgreSQL. 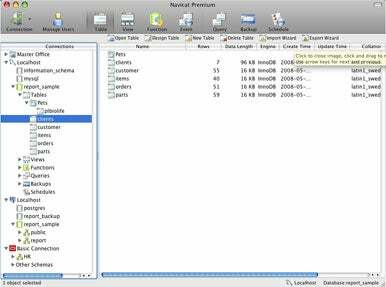 Navicat Premium users can transfer or migrate data between different database types or to a plain text file with designated SL formating and encoding. According to PremiumSoft, Navicat Premium also supports most of the features in MySQL, Oracle and PostgreSQL including Stored Procedure, Event, Trigger, Function, and View, among others. Bare Bones Software has released BBEdit 9.2.1, a maintenance update to its text and HTML editor for the Mac. iPresentee has released Keynote Themes 5.0—10 new themes to use with Apple’s Keynote presentation software. It costs $25. Invoices 2.5 is the latest version of Tension Software’s invoice creation and management software for the Mac. It helps you create customized invoices you can use to request payment from clients, and it performs automatic calculations of tax and total, lets you enter product items with your own code and price, and maintains a customer database.